Art Bergmann performing at the 10 Day Cafe in Stratford, Ontario in 1996.
didn't think this was ever gonna happen but Art Bergmann is coming to Bozzini's. Beginning in high school and into the 90's Art was one of my favourite artists so it is truly a pleasure to host him at Bozzini's. One of Canada's finest songwriters, ever. The Apostate” is Art Bergmann’s first full length of new material since the Juno winning “What Fresh Hell Is This” and is the follow up to his well-received 2014 EP release “Song For The Underclass”. Mesmerizing and masterful, “The Apostate” displays a rejuvenated singer songwriter who at the top of his lyrical game, has pushed his sound significantly, creating some of his most dynamic songs ever recorded. More country and eastern folk flavored then previous albums, Art is forging new ground and claiming his forthright place amongst his contemporaries, while continuing to re-establish his brilliant and eclectic past body of work. The atmosphere featured on this release is at times moody and desperate, but in the best possible way. The use of discordant sounds and instruments nontraditional to cliché rock music helps to create a vast soundscape of impressive scope. It is true art, beyond classification, and evidence of a growth in Art’s song writing, musician ship as well as performance. Recorded this September with producer Lorrie Matheson at Arch Audio in Calgary, the album features eight newly penned songs and a cast of stellar musicians. 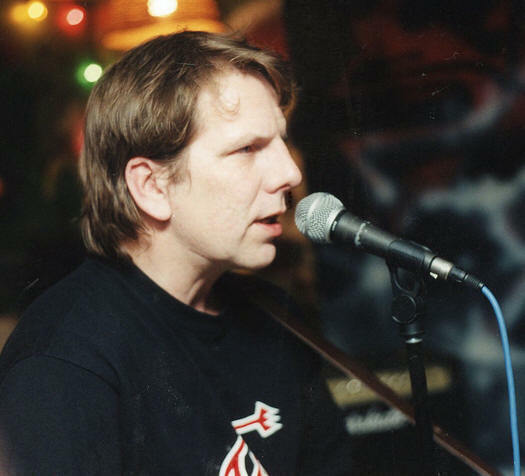 Art Bergmann's career began with his first band, The Schmorgs in 1977. He joined the K-Tels the following year, releasing two EPs before changing their name to The Young Canadians. In 1981, Bergmann joined Los Popularos and the band recorded a four-song EP. In 1984, he formed Poisoned and they recorded two demo tapes and a 6-song EP with producers Bob Rock and Paul Hyde. In 1988, Bergmann signed with Duke Street Records and released his first album under his own name, Crawl With Me, produced by John Cale. 1989's Sexual Roulette and 1991's Art Bergmann soon followed and in 1995, What Fresh Hell Is This? earned him a Juno Award. Bergmann released two more albums, 1998's Design Flaw and 2000's Vultura Freeway before relocating to a farm in Alberta and retiring from the music business - temporarily. After a period of self-imposed exile, Bergmann began writing again and returned to the stage in 2013 performing sold-out shows in Calgary, Victoria, Vancouver and Toronto. Bergmann released a critically acclaimed 4-song EP in 2014, Songs For The Underclass, and he became enthused about making/performing music again. Bergmann recorded a new album, The Apostate, in September 2015 with producer Lorrie Matheson at Arch Audio in Calgary and it will be released officially in Spring 2016.